ROCKLAND, Mass., March 29, 2019 – EMD Serono, the biopharmaceutical business of Merck KGaA, Darmstadt, Germany, in the U.S. and Canada, today announced that the U.S. Food and Drug Administration (FDA) has approved MAVENCLAD® (cladribine) tablets for the treatment of adults with relapsing-remitting disease (RRMS) and active secondary progressive disease (SPMS). MAVENCLAD is the first and only FDA-approved treatment for RRMS and active SPMS that provides two years of proven efficacy with a maximum of 20 days of oral treatment, during a two-year period. 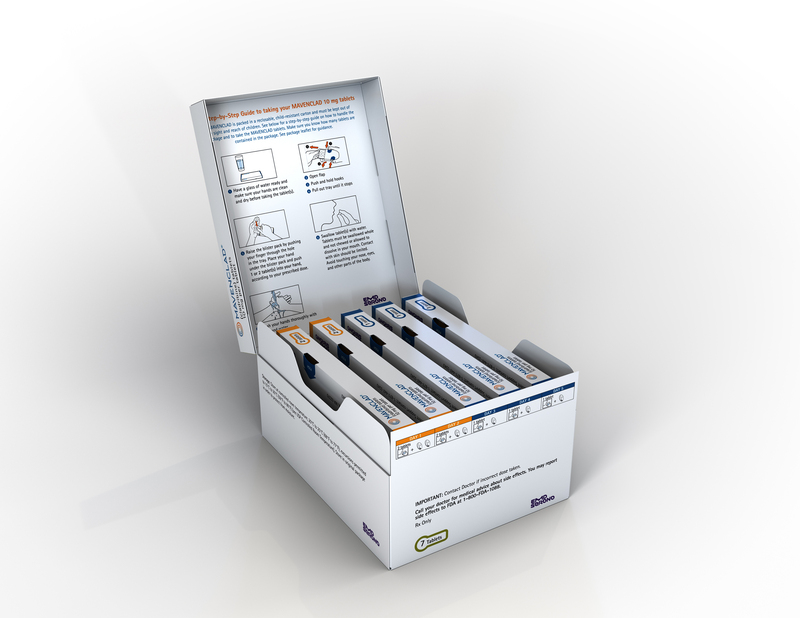 Because of its safety profile, use of MAVENCLAD is generally recommended for patients who have had an inadequate response to, or are unable to tolerate, an alternate drug indicated for the treatment of multiple sclerosis (MS), and MAVENCLAD is not recommended for use in patients with clinically isolated syndrome (CIS). The MAVENCLAD label includes a boxed warning for potential risk of malignancy and risk of teratogenicity. The label appropriately defines the relevant associated contraindications. Eighty-five percent of people living with MS are initially diagnosed with RRMS, characterized by attacks of new or increasing neurological symptoms. Most people with RRMS will eventually transition to a secondary progressive course in which there is a progressive worsening of neurologic function over time.1 SPMS can be further characterized at different points as either active (with relapses and/or evidence of new magnetic resonance imaging [MRI] activity) or not active. Patients experienced a 58% relative reduction in the ARR with MAVENCLAD compared to placebo (0.14 vs. 0.33, p<0.001). 81% of patients were free of relapses after two years of short-course oral treatment with MAVENCLAD, compared to 63% of patients who received placebo (p<0.05). Patients treated with MAVENCLAD had a 33% reduction in risk of 3-month confirmed disability progression as measured by Expanded Disability Status Scale (EDSS) compared to placebo (p<0.05). Patients taking MAVENCLAD experienced a lower median number of T1-weighted gadolinium-enhanced brain lesions and new or enlarging T2 brain lesions compared to patients with placebo (0 vs. 0.33 and 0 vs. 0.67, p<0.001). The most common (>20%) adverse reactions reported in the pivotal Phase III study, CLARITY, were upper respiratory tract infection, headache and lymphopenia. Serious adverse reactions reported in the clinical program included malignancies (0.27 events per 100 patient-years) in MAVENCLAD treatment arms, compared to placebo patients (0.13 events per 100 patient-years), and herpes zoster infections (2.0% vs. 0.2%) and oral herpes (2.6% vs. 1.2%). Following the administration of two treatment courses, additional courses of MAVENCLAD are not to be administered. Re-treatment with MAVENCLAD during years three and four may further increase the risk of malignancy. The safety and efficacy of reinitiating MAVENCLAD more than two years after completing two treatment courses has not been studied. EMD Serono is committed to helping support patients prescribed MAVENCLAD. 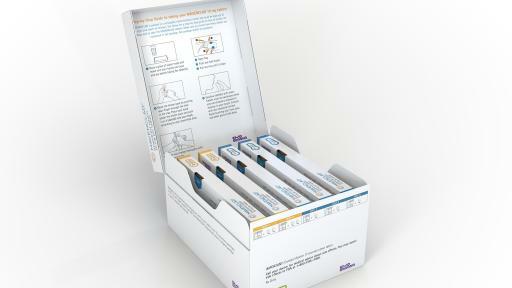 Over the course of 16 years, the company’s comprehensive patient support program in the U.S., MS LifeLines®, has had over four million touchpoints with patients, care partners, healthcare professionals and other stakeholders to support our goal of providing one-on-one assistance to U.S. patients prescribed an EMD Serono MS therapy. MS LifeLines is now expanding to help patients prescribed MAVENCLAD and offers personalized patient support, including assistance with navigating insurance questions and additional resources that may be able to assist patients who are uninsured or underinsured. The U.S. approval of MAVENCLAD follows its approval in over 50 countries, including the European Union (EU) in August 2017. MAVENCLAD, approved by the U.S. Food and Drug Administration (FDA) on March 29, 2019, is the first short-course oral therapy for the treatment of adults with relapsing-remitting disease (RRMS) and active secondary progressive disease (SPMS). MAVENCLAD is not recommended for use in patients with clinically isolated syndrome (CIS) because of the risk of malignancy. Patients should follow healthcare provider instructions including cancer screening, contraception and blood tests. The approved dose of MAVENCLAD is 3.5 mg per kg body weight over two years, administered as one treatment course of 1.75 mg per kg per year, each consisting of two treatment weeks. The mechanism by which cladribine exerts its therapeutic effects in patients with multiple sclerosis has not been fully elucidated but is thought to involve cytotoxic effects on B and T lymphocytes through impairment of DNA synthesis, resulting in depletion of lymphocytes. MAVENCLAD causes a dose-dependent reduction in lymphocyte counts followed by recovery. 1National MS Society. Secondary progressive MS (SPMS). 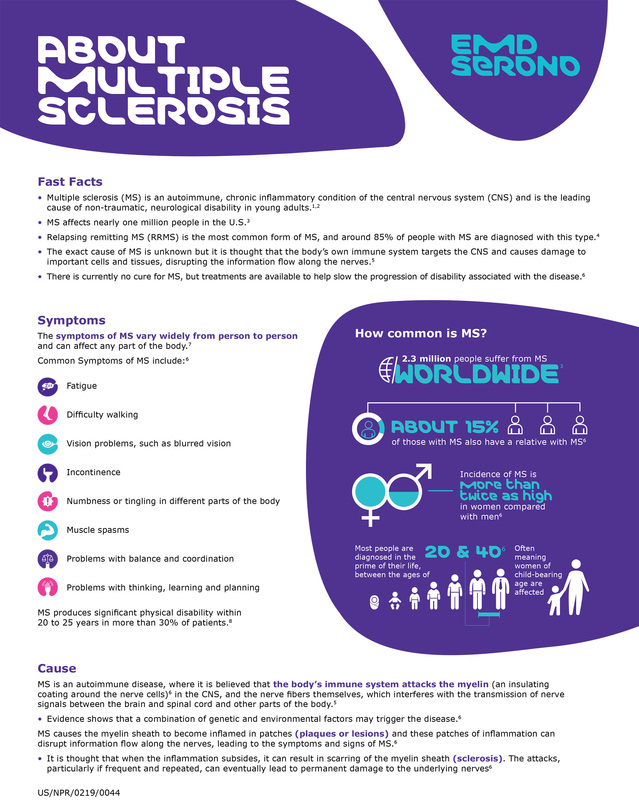 www.nationalmssociety.org/What-is-MS/Types-of-MS/Secondary-progressive-MS. Accessed March 2019.